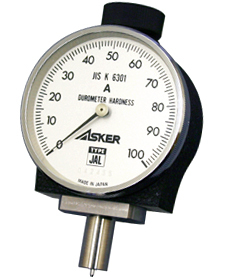 Used world-wide for measuring hard rubbers and plastics, and specified in the standards of JIS K 6253, ASTM D 2240, ISO 7619, DIN53505, etc. Widely used for measuring soft rubber, sponges, and other foam elastomers, as well as rolled-threads, -films and textile windings (yarn packages). 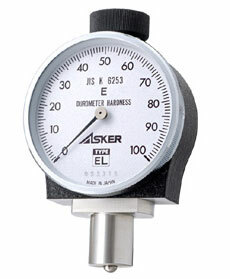 The ASKER Durometer Type E for soft rubber (low hardness), as specified by JIS K 6253 and ISO 7619. 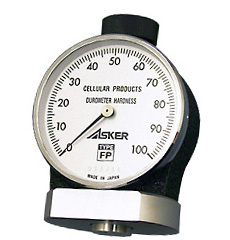 Pressure foot plate is designed to be smaller in dimensions and an oval shape in accordance with the size of powder puff. 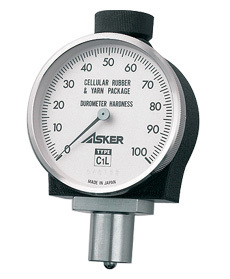 It has recently been used additionally for gel materials, soft rubber rolls, etc. 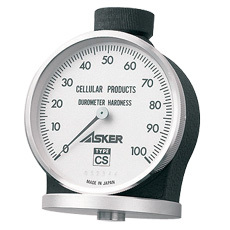 The ASKER Durometer Type CS is designed to decrease false readings of measurements for polystyrene foam by simultaneously deforming multiple granular foams. 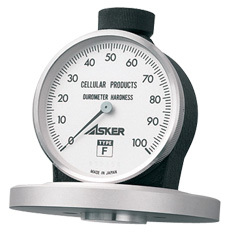 The larger indentor and stronger spring than those of the ASKER Type C enable the stable measurement of large-sized granular particles such as polystyrene foam. It is used for measuring harder specimens, such as earthenware clay or mossed pottery, than the Type A durometer, because the indentor is spring-loaded as in the ASKER Type A, but is a conical shape as in the ASKER Type D.
The ASKER Durometer Type JA for general rubber, conforming to the specifications of the former JIS K 6301. 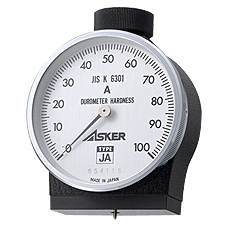 It complied with Spring type hardness tester Type A in the formerly applicable standards of JIS J6301"Physical Testing Methods for Vulcanized Rubber", abolished in Aug, 1998. 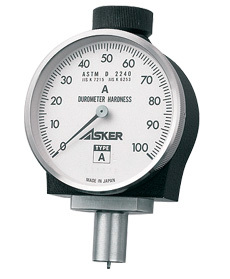 However, it is used even now for measurement data or internal management data upon the agreement of concerned parties due to its extensive use historically within the rubber industry. 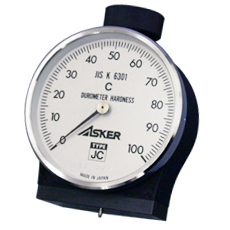 The ASKER Durometer Type JC for general rubber, thermoplastic elastomers and soft plastic conforming to the specifications of the former JIS K 6301. It complied with Spring type hardness tester Type C in the formerly applicable standards of JIS J6301 "Physical Testing Methods for Vulcanized Rubber" , abolished in Aug, 1998. 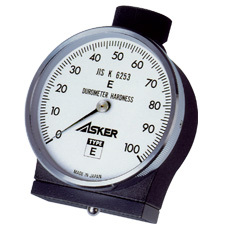 However, it is used even now for measurement data or internal management data upon the agreement of concerned parties due to its extensive use for many years within the rubber industry. One of the most important steps in using a durometer (rubber hardness tester) is to select the optimum type. 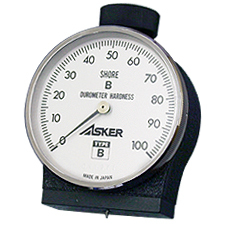 There are various types of durometer available based on different standards applied to a wide variety of subjects to be measured. 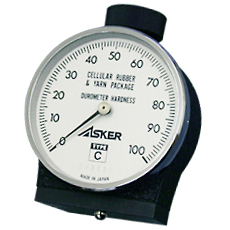 Among them the most popular models for rubber materials are ISO 7619 & ASTM D 2240-specified Type A Durometer (ASKER Model A) and JIS K 6301 (abolished)-specified Type A Durometer (ASKER Model JA). 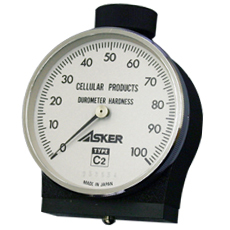 and ASKER-C (ASKER Model C) for soft rubber or flexible cellular materials. Model D has this type. Model A and JA have this type. Hemispherical point featuring larger contact area. ASKER C has this type. Soft rubber and sponge rubber.